Info: 2 BR, 2.5 BA Beachfront Property with 1,490+/- sq. 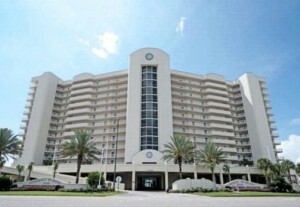 ft.
Orange Beach gulf-front condo for sale at Admirals Quarters. Panoramic Gulf front View from balcony, which is accessed from large Living/dining/kitchen area and Master Suite. This gulf-front resort property is being sold furnished. Master Suite and Guest Suite, ½ bath, wet bar. The beach residence is rental ready currently with Kaiser Rental Management. The condo has a coded lock for key-less access. Orange Beach has numerous public parks and boosts the largest charter-fishing fleet in the Gulf of Mexico, it is the easternmost community on Alabama’s Gulf Coast. Orange Beach offers miles of white-sand beaches, the interior bays and bayous just north of Perdido Pass provide fior ample water-sports and outdoor activities. The post Orange Beach Condo For Sale at Admirals Quarters appeared first on USBeaches.net.